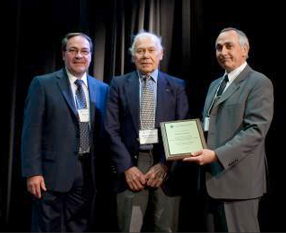 June 1, 2010 - MPB Technologies Inc. was awarded a plaque on May 14, 2010, from the Quebec Photonic Network at a ceremony in Montreal celebrating the 50th anniversary of the laser. Dr. Morrel Bachynski, founder of MPBC, was available to receive the award, which cited MPB Technologies Inc. for its outstanding contribution to the Québec economy through its science and technology development of optical photonics. As part of the event, Dr. Bachynski presented a slide show on the evolution of lasers at MPBC, which spans from Carbon dioxide back in 1977 to Continuous Wave Fiber Lasers in the visible region of the spectrum, now finding applications in biophotonics processes. In addition, the MPBC expertise has found its way into several major international projects including an experiment on the European Space Agency PROBA 2 satellite, and the co-development of the European Southern Observatory’s “Artificial Star”.